More and more organisations are focusing on being ‘a force for good’. This may be under the umbrella of calling themselves ‘purpose led’, a social enterprise, cooperative, focused on ‘conscious capitalism’ or even certification under B Corp status, a system for businesses that meet certain standards of social, environmental, accountability and transparency performance criteria. What binds these movements together and what does good mean? At Improveon we believe that what actually binds them together is a focus on creating wellbeing. We define wellbeing as ‘the longer term state where people can be at their best for themselves, others and the world around them’ and it includes spiritual, psychological, physical, social, financial, cultural and environmental elements. When you think about it wellbeing is at the heart of everything you do as an individual, team or organisation, so we provide consulting and coaching services to help you in each of these areas. 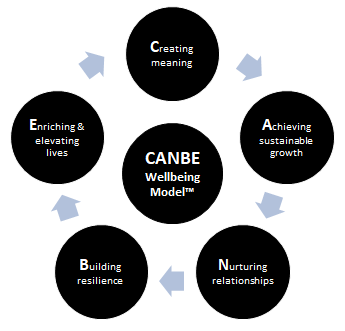 Our proprietary CANBE model of wellbeing pictured above is the starting point for this. By understanding the big picture first we reveal the connections between each of the parts and can then put forward the most effective solutions. 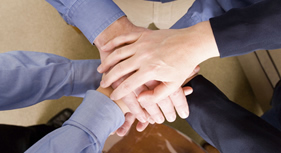 Nurturing strong, trusting relationships with colleagues, employees, customers, suppliers, communities and investors. 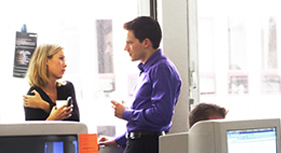 Enriching experiences for you personally, colleagues, customers, suppliers and communities. Enjoy what you do more! LeaderCANBE™ is a unique system based on years of research into what makes a great leader and uses the latest thinking in neuroscience, positive psychology, wellbeing and engagement to provide you with the greatest potential to transform your organisation and achieve the impact you desire. 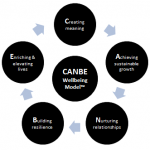 Whether you are transitioning to a new role, leading your organisation through change, developing a clear plan and strategy or empowering and engaging your people LeaderCANBE™ provides a flexible framework and approach to help you identify the key areas of focus and implement focused activity. You will be supported by a ‘partner’. We take a systemic approach. The focus of support will be directed on helping you become a better leader for yourself, the people around you and your organisation. We will work flexibly with other experts, as required, to help you get where you want to be. Designed for aspiring and existing leaders the relationship will typically begin with a LeaderCANBE™ review and other assessments to reveal the key areas you’d like to focus on. Services can then be provided from the following but are tailored uniquely to fit your requirements. We will do everything we can to support you becoming the leader you want to be. Just ask. Through a joint venture with Cumulus Outdoors we can provide unique experiences for leadership teams or individual leaders from across different business sectors. An evolving online networking group for up to 8 leaders from across sectors to share wider experiences, support each other and improve performance. 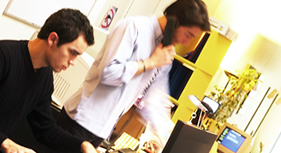 Bespoke support provided to help you move forward on a strategic issue.